First Hive Inspection of 2013–At the End of May for Goodness Sake, But Then This is England!! 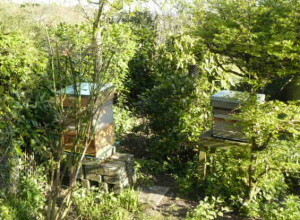 Finally a warm and sunny day enabling my neighbour Debs and me to inspect our respective hives. Below average temperatures, cold blasts of Arctic wind and above average rainfall in the UK resulted in a long drawn out winter that superseded Spring and threatened to drag itself into the summer months. We had no idea what had been going on amongst the colonies as we felt it safest to leave them in peace and not risk disturbing their clusters. But the occasional sight of a brief sortie by a few brave foragers and a constant supply of home made bee candy placed on top of crown boards had given us hope that all was not lost. First foragers of the year, squeezing through mouse guard. So now here we are at the end of May. A pre-planned plant and seed swap event at our allotment meant we couldn’t get to our hives until late afternoon but the bees were still happily foraging in the welcome sunshine and took not one bit of notice of the first whiff of smoke as we removed the roof of Deb’s hive. 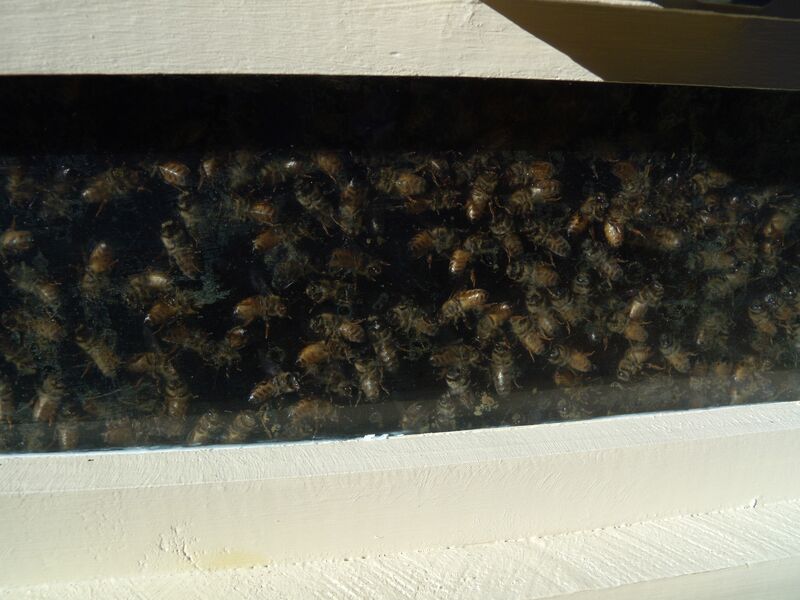 We both use National hives, and hers has a clear perspex crown board enabling a good view without too much disturbance of what’s going on inside. 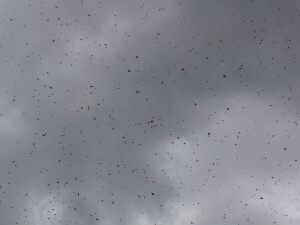 Things looked promising when a mass of bees could be seen spilling over the top of the frames. This hive is made up of double brood boxes in an effort to allow the queen more space to lay her eggs, thus avoiding swarms–this after a previous bad year of lost bees and lack of honey. 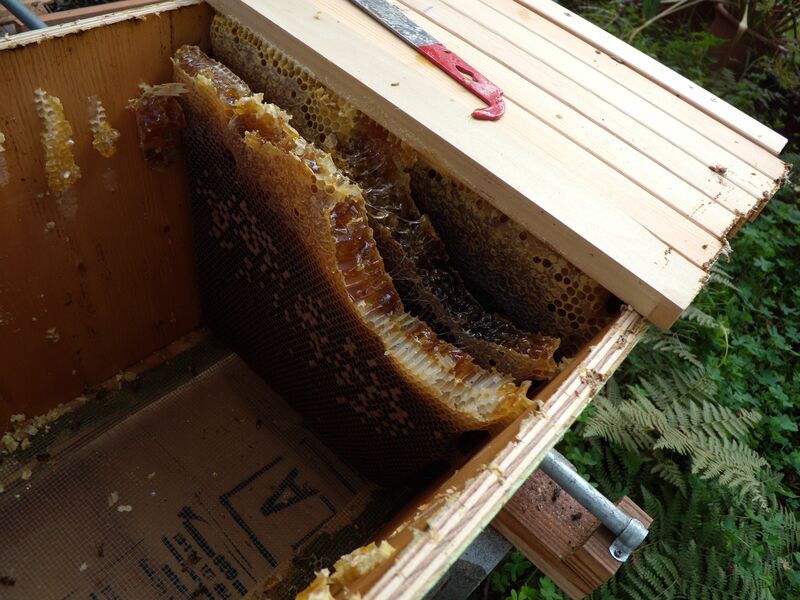 It seems to have worked because the top box currently holds 7 frames of eggs and capped brood while outer frames have plenty of fresh capped honey and nectar. Last autumn the queen had been sought, placed in the lower box and a queen excluder put between the two in order to contain her in the bottom of the hive where it should be warmer. That queen excluder had been removed in April and it seems she immediately moved upstairs to continue laying. So in spite of the awful weather bee life had continued in the confines of the hive. 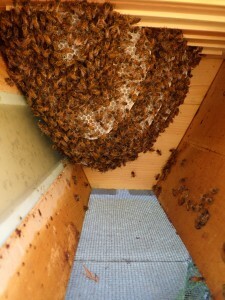 A sighting of eggs, larvae, capped brood and bees bringing in pollen was sufficient enough proof that the queen was present so we didn’t seek her out but instead placed a new super on the hive and popped the roof back on. So far so good! Previous year’s swarm hanging out under rose arch. We moved across to my garden where I currently have two hives tucked amongst hedges and shrubs that offer some protection from our inclement weather. The first one we inspected had unfortunately swarmed last year rapidly followed by two casts that left the colony so depleted they struggled to get their numbers back up before winter set in. To be honest I doubted they’d survive but think their saving grace was a late autumn supply of pollen, loved by our bees, courtesy of a relatively recent introduction into the UK of an invasive plant called Himalayan balsam. Throughout September and October its seed pods explode like party poppers, spreading the following year’s young plants further afield across our open countryside. Some consider it a menace but beekeepers can be found collecting the pods and tossing them about to their hearts content, me included! This colony is still small and although the queen is doing her best to expand their numbers I’m not sure they will tolerate her for long if she doesn’t pull her socks up. My plan is to leave that decision to the bees and wait to see if they supersede her. 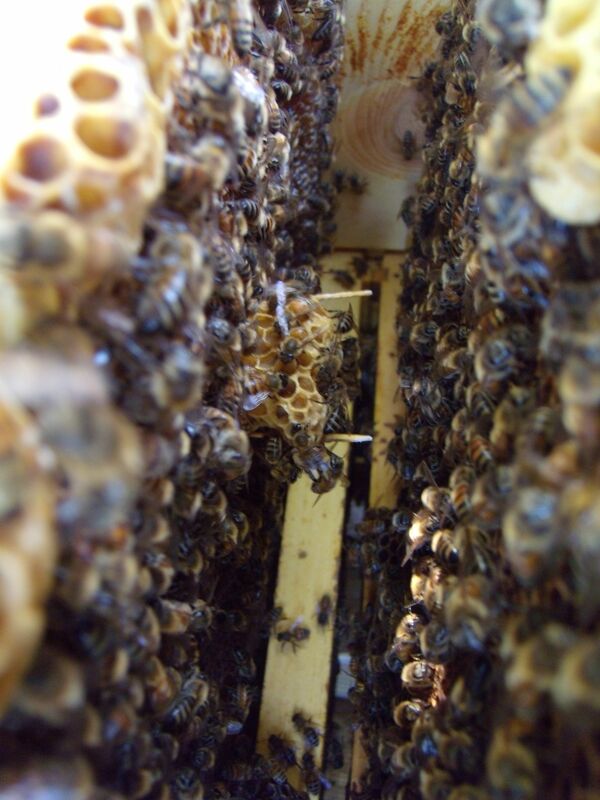 If not, and things don’t improve, I’ll wait until my other hive produces queen cells and then place one or two on a frame of her brood to encourage them to raise a new queen courtesy of a stronger colony. 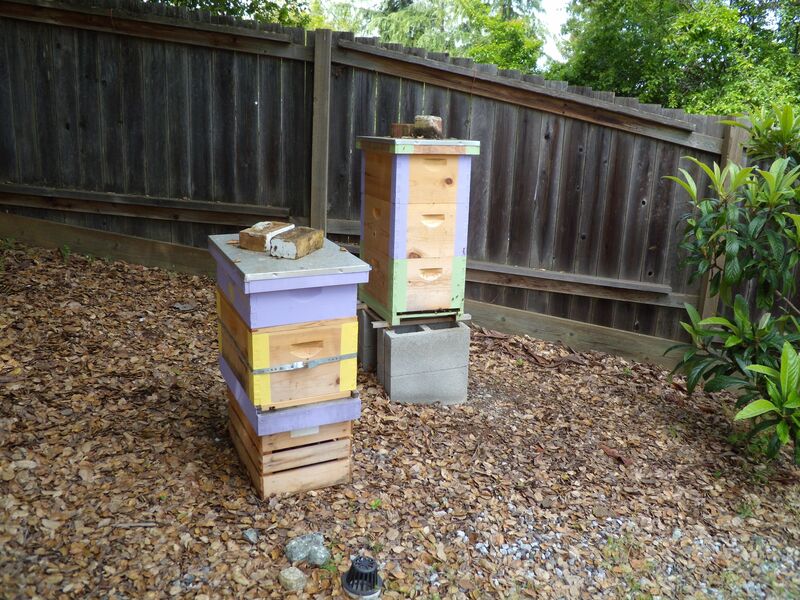 There’s already a super on this hive but I counted no more than 20 bees roaming about doing nothing constructive, and the foundation has not been drawn out so nothing to get excited about. 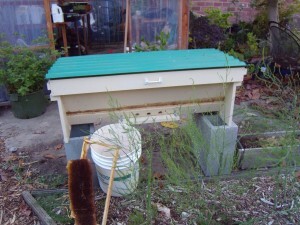 My second hive has a completely different story. A super added a couple of weeks ago already has frames of capped honey and plenty of bees working on it which, considering the previous bad weather, is a miracle! 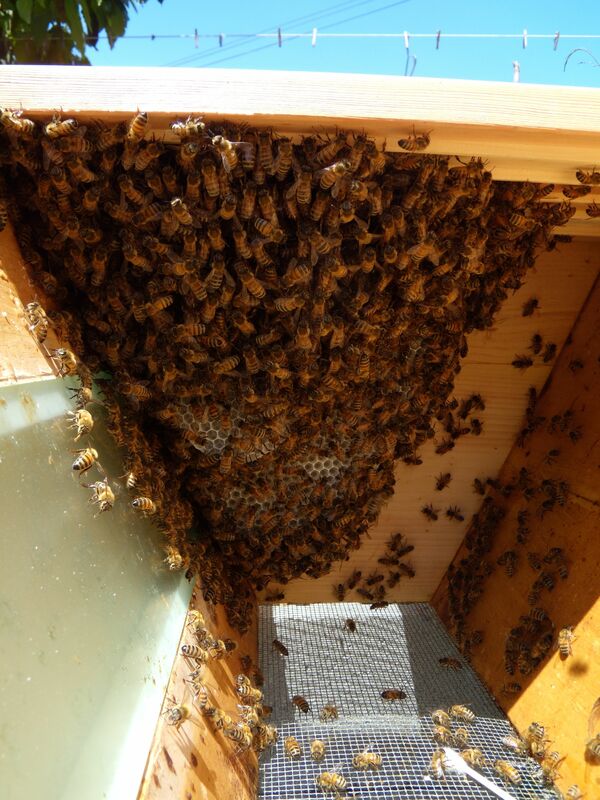 Double brood boxes means this queen also has room to move around, and that’s exactly what she’s done. When earlier in the year I’d replaced the old solid floor with a mesh varroa type, the top box had been almost too heavy to lift what with all the balsam honey crammed in it. 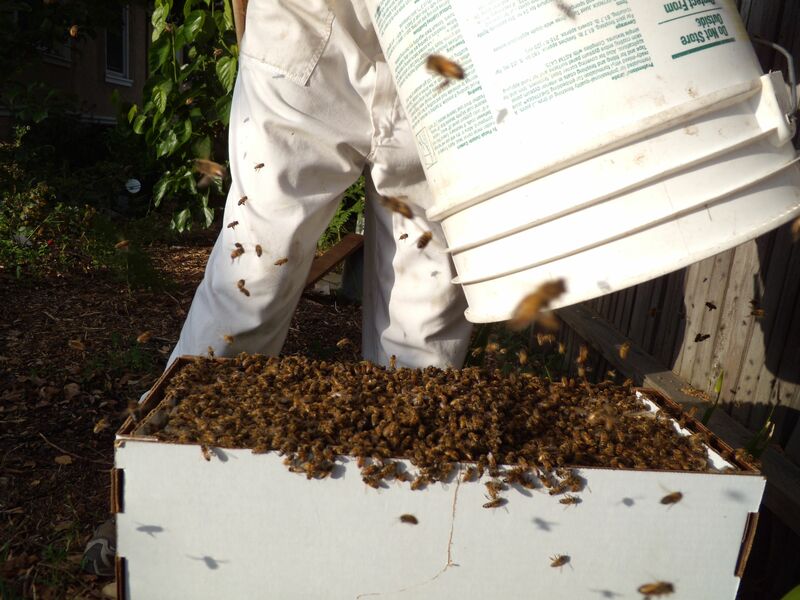 But now, finally, the bees are extracting that honey for food and six frames are covered in eggs and capped brood. For all that I decided against going through the lower brood box as the bees were content so again we didn’t seek out the queen…. it’s obvious she’s doing a brilliant job and that’s all I need to know right now. My double brood National hive together with smaller colony. Sighs of relief all round that our bees have come through not only a dreadfully long winter but a previous year that was the wettest on record. 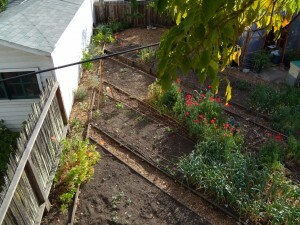 So, comparing our experiences with those of our Overall Gardeners…. well, there really is no comparison since our principles of bee management must out of necessity differ in every way! 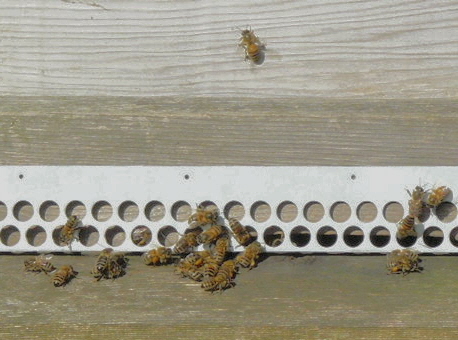 Because I don’t really trust bees in top-bars to build straight comb, I checked up on the swarm in our new top-bar hive again today. It’s been two weeks exactly since they swarmed, and I compulsively peek at them through the observation window multiple times a day, but I wanted to make sure nothing funky was happening out of sight. First off, they still look fabulous! 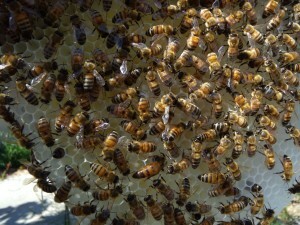 Who would have thunk that honey bees would build straight comb all by themselves, in our apiary?! I’m floored. They already have some capped honey and a few bees bringing in pollen. Two minutes into the inspection, whom should I find but the plump, beautiful queen, wandering briskly up and down one of the larger combs. The million-dollar question is whether she has already mated and if she has begun laying eggs. She looked as big to me as a mated queen, but then, our virgin queens tend to look big to me. I didn’t see her lay an egg, but the bees around her were paying plenty of attention to her, and there was a general commotion wherever she passed. 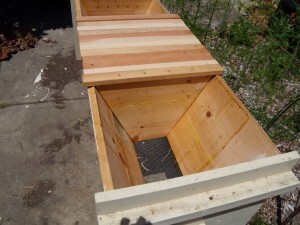 Because it’s a top-bar hive, it’s not as easy to tilt the comb toward the light to really get a good look for eggs. And besides, the wind was suddenly coming up, and it was making me nervous to have the queen running around out in the open. The queen, with her head in a cell (she is centered toward the bottom of the frame). 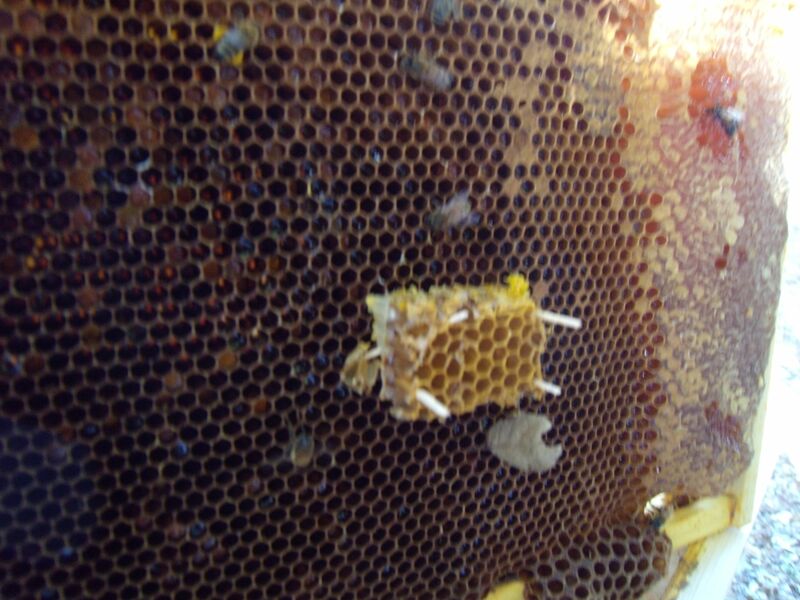 Maybe the best clue to her laying status was that, as I watched, the queen bee stuck her head into several cells of nectar and emerged with her tongue out. From my brief subsequent foray into the bowls of online bee forums, it appears there’s a general consensus that laying queens do not feed themselves, while virgins often do. My personal hunch, for what it’s worth is that this queen has mated (hence all the attention paid her and the little bit of pollen coming into the hive these past two to three days), but that she has perhaps not quite started laying. 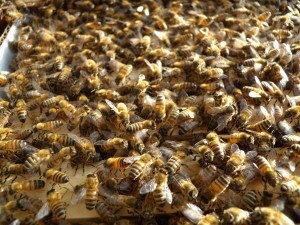 If I go into the hive again in a week, I’m betting I’ll find brood. Cross-combing is a huge pain to deal with and is common in top-bar hives and in Langstroth hives with foundation-less frames. Following are a few pointers on how to avoid the hassle. 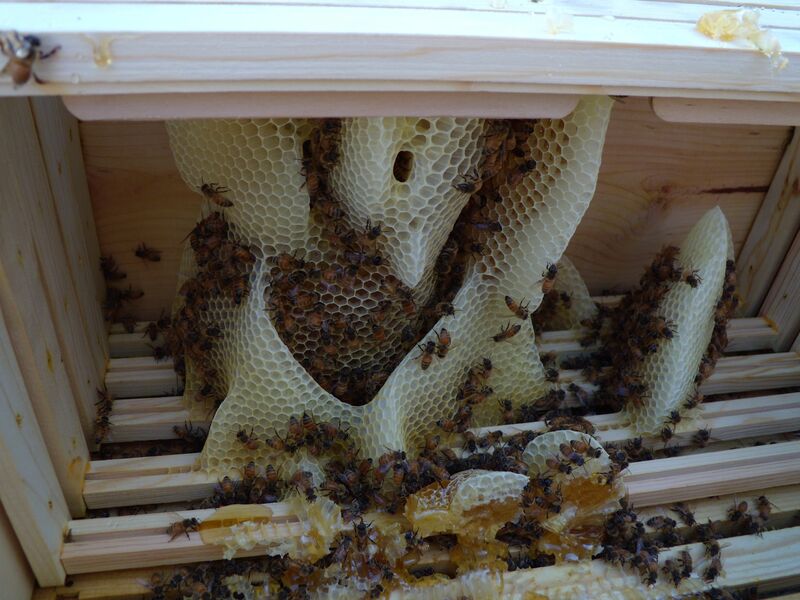 Place new top-bars and foundationless frames between combs that are full of brood, pollen, or capped honey. 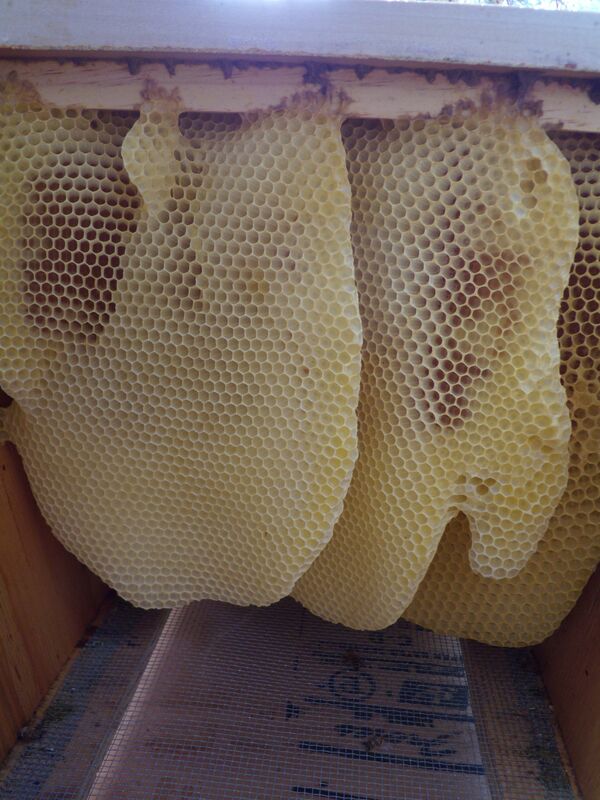 DO NOT place new frames or top-bars next to uncapped honey. 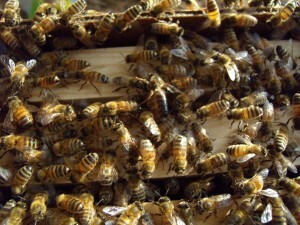 If you do, the bees are liable to continue drawing out the cells, leading to bulges in the comb. 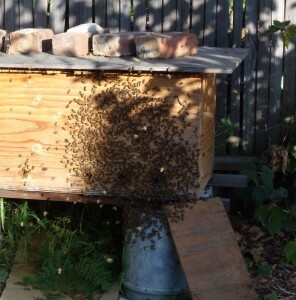 All you need is one bulging comb for a domino effect in the hive. 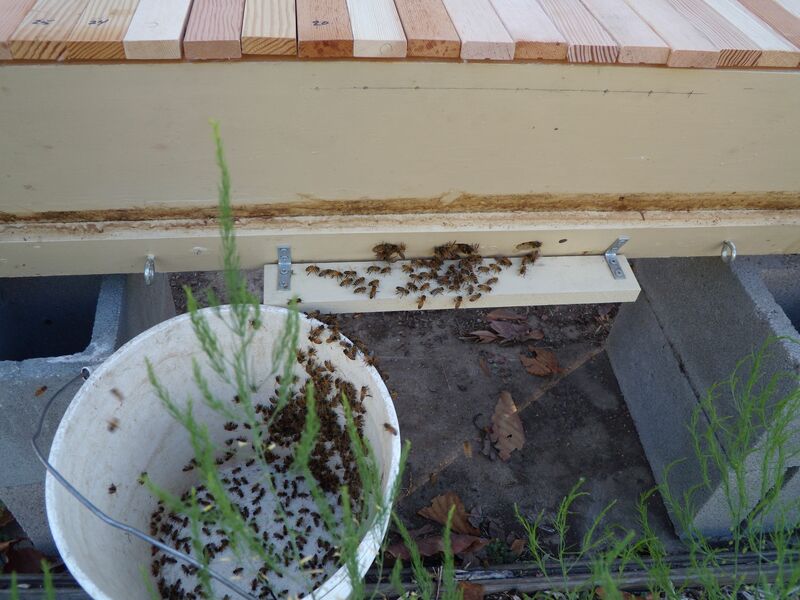 After hiving a swarm, use follower boards (in Langstroth hives) or divider boards (in top-bars) to limit the space the bees have. They are more likely to draw straight comb when their space is limited. Make absolutely certain that the hive is plumb. Yep, get out your level, your shovel, wood shims, whatever it takes. 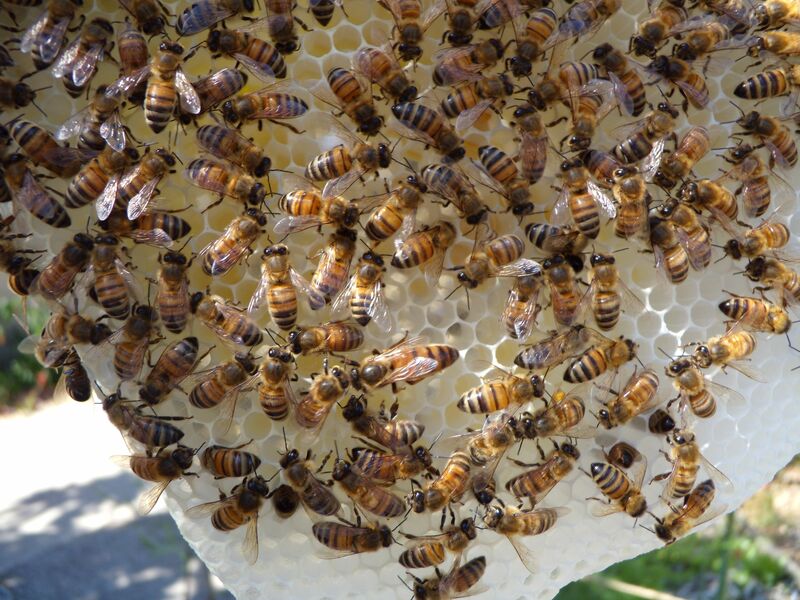 Bees draw their comb with gravity, so a hive that sits unevenly will lead to similarly uneven comb. Check early, and check often. If you find cross-comb, attend to it right away. Remove the offending comb entirely, or use a knife to detach comb that bends or runs between bars, and gently straighten it and press it onto the tab you want the bees to follow. However painful it may seem to perform this kind of hive surgery now, rest assured that it will only be a hundred million times worse if you wait. No, really. Cross-combing in an established top-bar hive. Each comb connects to multiple bars, making it impossible to lift the bars without ripping comb. Ugh. 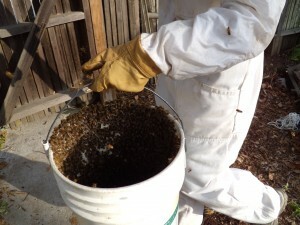 And here is what happens when you do remove top-bars in such a hive. (Actually, this photo is minus the bees. Their presence makes the whole situation 100 times more traumatic). 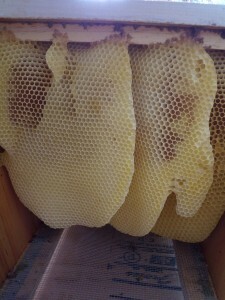 Crazy comb in a Langstorth hive with foundation-less frames. 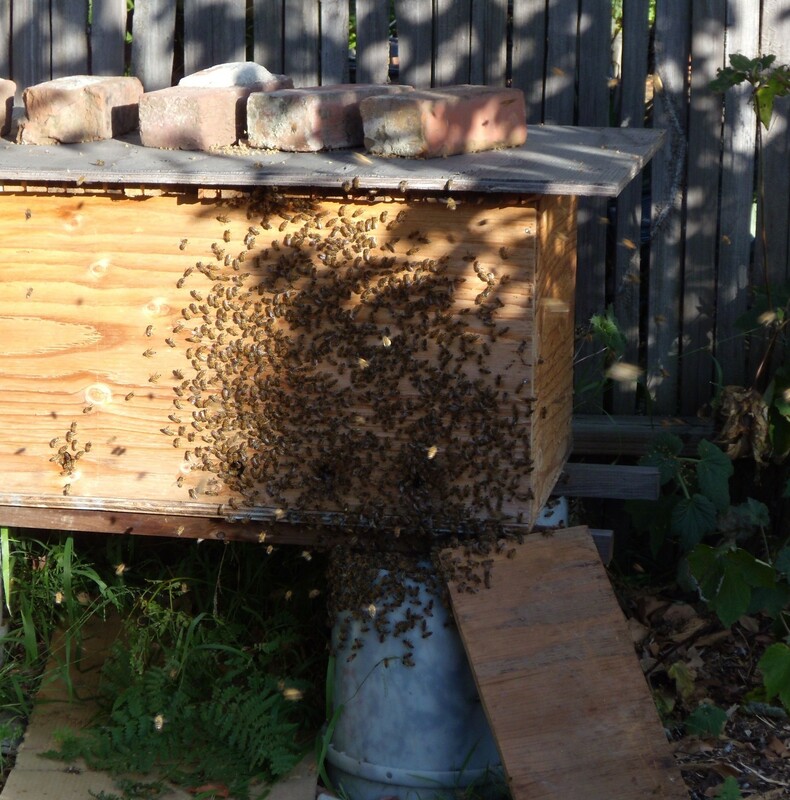 When we added a second box, the bees disregarded the frames entirely and made something of a wax and honey pyramid, instead. 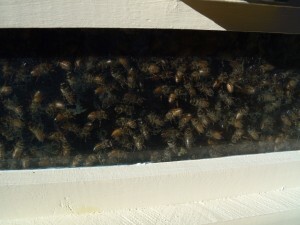 I opened up the fabulous observation window top-bar hive today to make sure the bees weren’t drawing any crazy comb. These bees are my heroes! They have drawn the combs perfectly straight and hanging from the tab on each top-bar (instead of, as has always been my experience, stringing wax comb from one top-bar to the next). To top it off (sorry! ), they’ve drawn five combs already and are at work on the sixth. 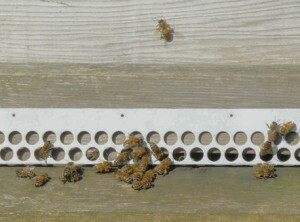 I decided to play it safe by removing some of the extra top-bars from the box, so that the bees have less room to play with for the time being. They now have a total of ten frames (six currently in use and four blanks) sandwiched between divider boards. This limited space will hopefully help keep them on their good comb-drawing behavior. I haven’t fed this swarm at all, but you can see the bees’ curing nectar toward the top of the comb. ‘Em’ and ‘May’, shortly after splitting. On April 26th, I inspected the first beehive split (christened Blazer—as in trail blazer) and her mother hive, Hortensia. 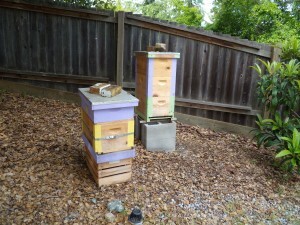 The mother hive was full of both capped and uncapped brood (yay!!! ), but Blazer still had nothing. I selected a frame of eggs from Hortensia and placed it beside a frame of pollen and nectar in the split. I returned on May 2nd and found that the bees were in the process of building a queen cell. It wasn’t yet capped, but I have to say that it looked kind of ‘puny’ to me. The split has plenty of bees (about five drawn frames covered in bees) and plenty of pollen and nectar stores. We will check for signs of a laying queen toward the end of May. If the split appears queenless at that time, we will recombine it with Hortensia. I inspected both the split (Em) and the mother hive (May) on April 27th. The split was going gangbusters, with lots of uncapped brood and a plump new queen that I glimpsed running away from me down between two frames. 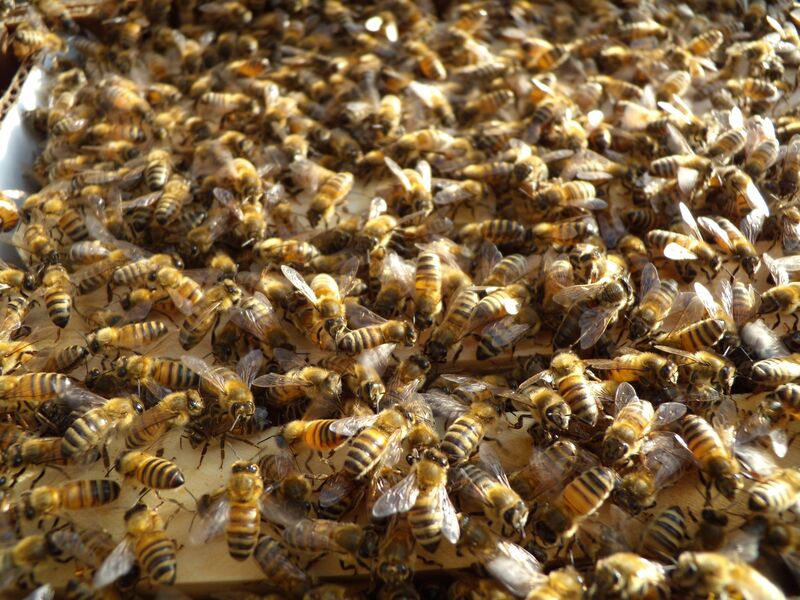 May had no brood in any of its three boxes, and the bees seemed disorganized and aimless. There were, however, still lots of bees in the mother hive. I returned to the split and removed a frame of eggs and young brood. I used an X-Acto knife to cut out a swatch of comb measuring approximately one by one-and-a-half inches. I specifically selected comb where I only saw eggs. I used four toothpicks at the corners of the comb to secure it in the middle of a frame of pollen and nectar in the mother hive. I made sure that this frame was facing another frame of nectar and pollen and that it was situated near the center of the middle box. There are plenty of additional stores in surrounding frames. I also removed one of the frames in that box to allow room for the protruding toothpicks and comb. I returned to inspect again on May 2nd. I found that the bees had built a smallish queen cell on the upper left corner of the attached swatch of comb. Surprisingly, the cell was already capped. This makes me wonder if I failed to spot a small larva in amongst the eggs, and if the bees chose this to be their queen. Looking down into the hive. 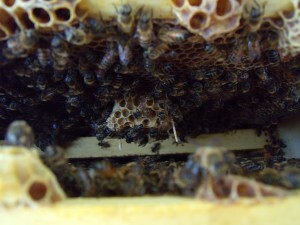 The queen cell is on the left, but bees are covering most of it. A side view. A bee is hanging onto the queen cell. I fear that the small size of the cell does not bode well for the queen’s viability. The small size may be due to the fact that older bees (the only bees left in this hive after more than a month without a queen) are not as good at feeding brood. 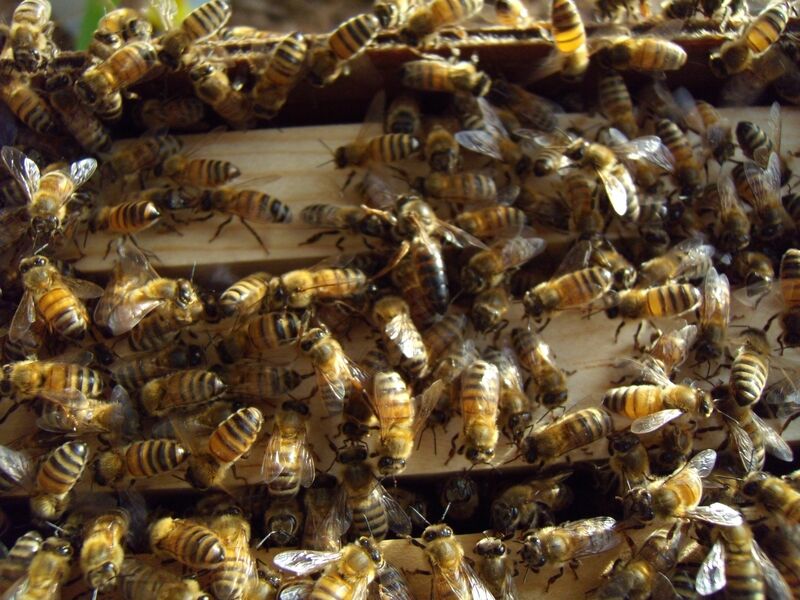 Older worker bees can revert to acting as nurse bees in cases of emergency, but they may not be able to produce the same quality or quantity of royal jelly, the food required by queen bees throughout their larval stage and through their adult lives. 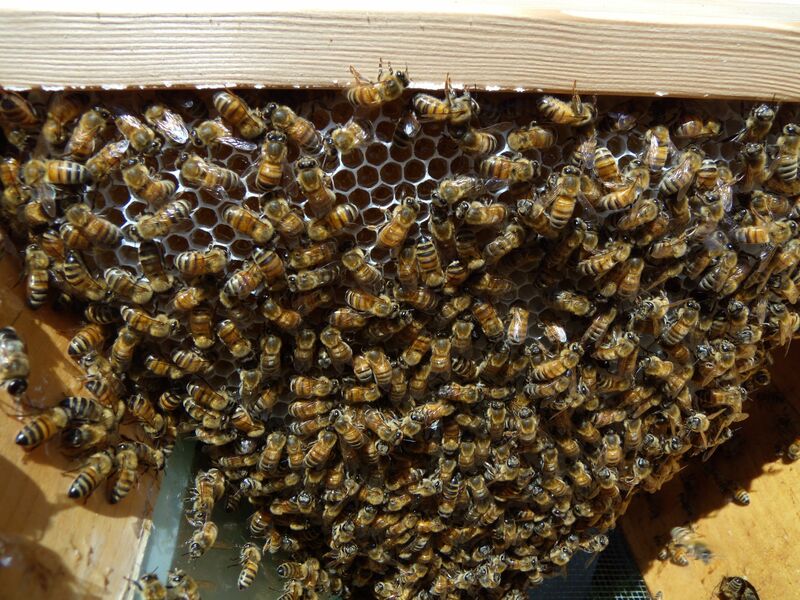 On the bright side, I did see a lot of activity on the frame with the queen cell, and a number of bees were covering the cell and moving around it. As with the first split, if May’s second attempt at queen rearing doesn’t pan out by the end of this month, we will recombine the hives. Why did one split and one mother hive fail to raise viable queens on their first attempts? In both cases, the mother hives had capped queen cells when I performed the splits. It’s possible that I jarred some of these cells, causing the unborn queens to fall to the bottoms of their cells and stopping their wings from properly developing. In this case, the young queens would not have been able to venture out for their mating flights. On the other hand, I found no signs of queens that had become drone layers (this is often the case when a virgin queen is unable to properly mate). Maybe it is more likely that the queens perished on their mating flights. We had some extremely windy days in April, and there is also always the possibility of a queen being eaten by a bird when she leaves the hive. Whatever the reason(s), we are keeping our fingers crossed for better results when the new queen cells hatch. 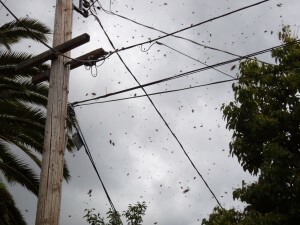 The bees just won’t quit, and today brought the first confirmed multi-queen swarm of the season. No sooner had I arrived home at about 2:40, than I saw Mondo beginning to swarm. Within about 20 minutes, they had settled in exactly the same portion of tree branch as Saturday’s swarm of bees. Too bad we took the ladder down yesterday afternoon! As we are now up to our eyeballs with 10 beehives, I called a new beekeeping friend who has been looking for untreated bees from a foundation-less hive. Mondo fits that bill. 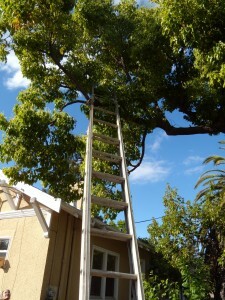 Shilpa arrived with nuc in hand, and we wrestled the ladder onto the same tree branch. 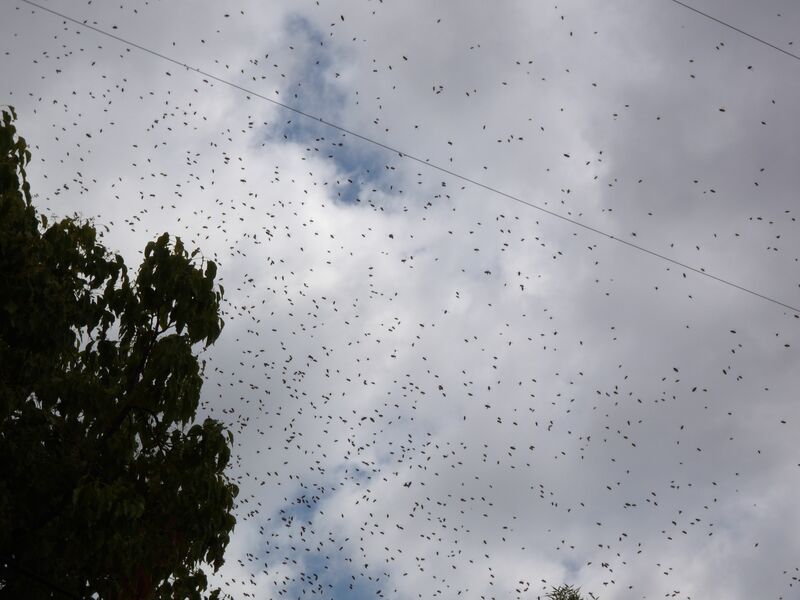 I never cease to be amazed by swarms of bees. The most notable observation we made today was sighting two different queens in the mass of bees in the nuc. The first was much darker than any Kelly and I have previously spotted in our apiary. Perhaps I should have shooed her down into the nuc immediately, because I believe (though I can’t be certain) that she took flight alone as I snapped pictures of her. 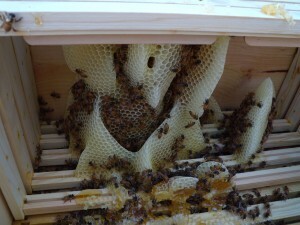 The second queen was blond, and wasted no time before diving into the nuc. Enjoy a few of the 79 pictures we took of the whole event! Somebody forgot to tell our bees that they shouldn’t swarm on a day forecast for showers. 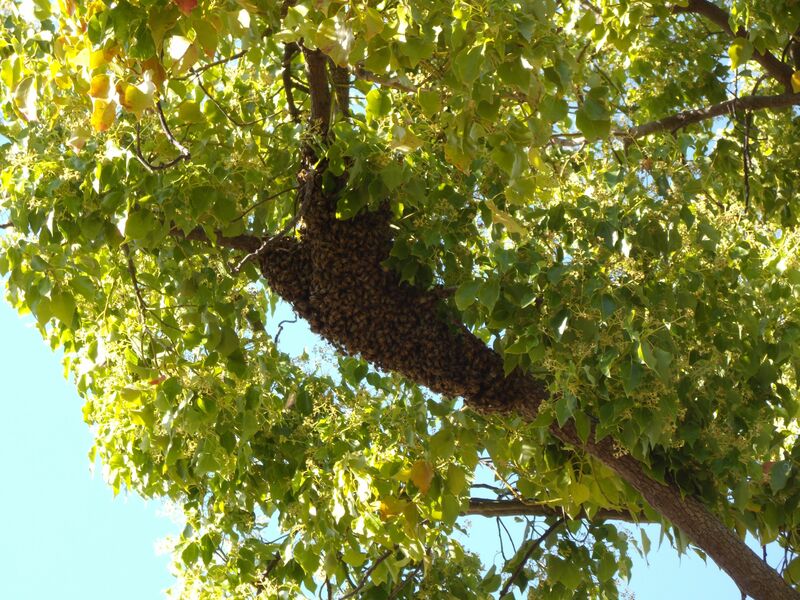 The swarm begins consolidating around the camphor tree. Thanks, Shilpa, for taking shots of me out on a limb. The paler queen can be seen her on the far left side of the second frame. A worker bee is partly obscuring her right side. The queen dove between the frames a few seconds later. The dark queen is slightly right of center, with her head pointing toward two o’clock. As always, you can click to enlarge. I believe this shot may capture the moment that the dark queen took off. She is dead center. 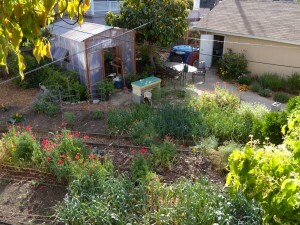 Going to great heights in a quest to capture swarms has given me some new perspectives on our garden (literally). 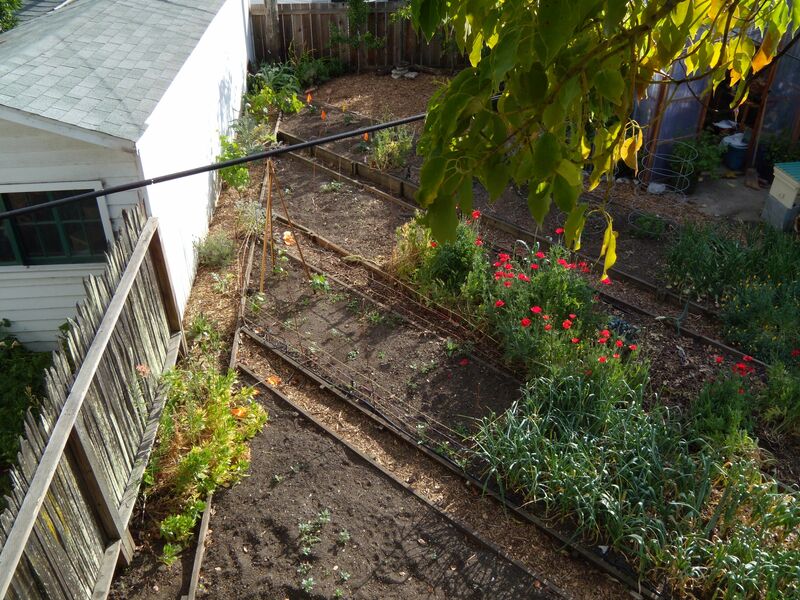 Before I took down the ladder this afternoon, I snapped a few bird’s-eye shots of the garden. The ‘Santa Rosa’ plum is in the foreground, and Mondo is just peeking out on the right. 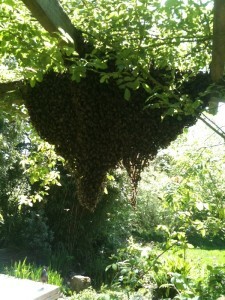 In the background, you can see last week’s hived primary swarm, ‘Juniper’ (so named for the tree in which it landed). The garden’s edge, where with any luck the grapes, artichokes, and lavender will take off this year. The heart of the garden. Yesterday’s swarm is hived just in front of the greenhouse (we’ll see how that works out!). Since the top-bar hive, Mondo, swarmed at the end of April, we’ve been waiting expectantly for secondary swarms. I even made a practice of suiting up and wriggling under the hive at night to listen for virgin queens piping (we were lucky enough to hear them last year!). 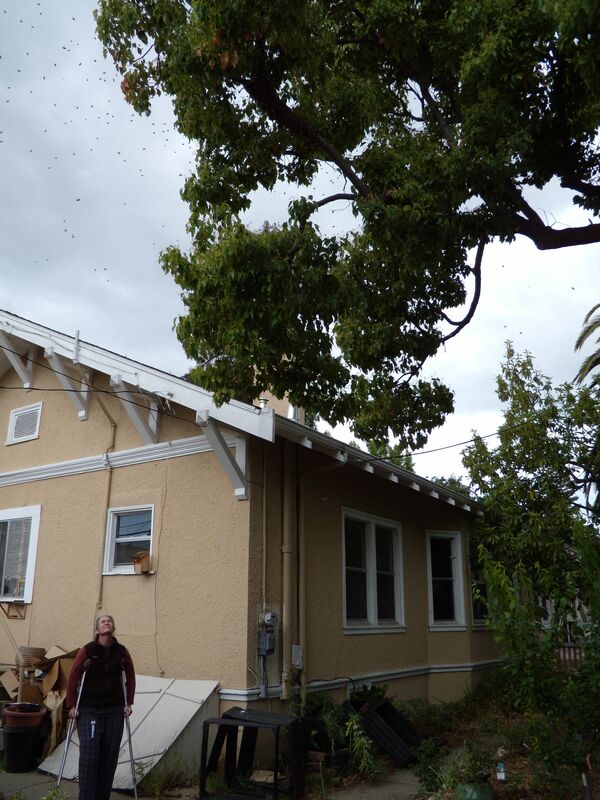 Today’s swarm in our bees’ favorite camphor tree. No luck hearing the queen piping, but today the bees swarmed late morning and settled high in the swarm catching camphor tree. Since Kelly is on couch rest following knee surgery, I called up our extremely kind, generous, and capable beekeeping friend Debi for reinforcement. She dropped everything and headed over. Egads. I’ve never loved heights. The swarm had settled near the end of a branch, and we were just able to position the extension ladder within reach. I tied the top of the ladder to the branch to be on the safe side and, leaning far out with a five gallon bucket in my left hand, I reached the dangling mass of bees and gently knocked them off into the bucket. 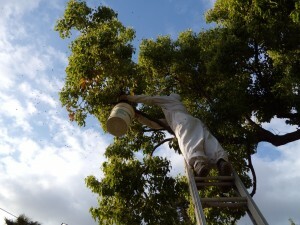 Normally, I would have preferred to give the branch a good shake to make the bees drop into the bucket, but this approach wasn’t feasible given my ladder positioning and the size of the branch. With bucket of bees in hand, I hightailed it down the ladder, speed-walked across the garden, and dumped the bees into our waiting top-bar hive (a fabulous contraption fitted with an observation window and crafted by another beekeeping friend). 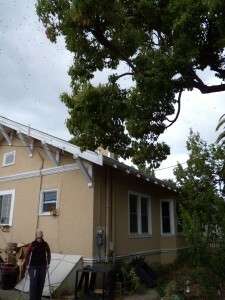 A few more trips up the ladder to knock down bees that were reassembling on the branch, and Debi and I deemed the operation a success. 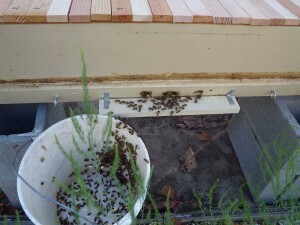 We were fairly certain that we had the queen safely hived, because when we placed a bucket of bees outside the top-bar, they immediately filed inside. Moments later, though, Debi pointed to Mondo’s front, where hundreds of bees now milled about. Were they coming, or going? Crouching beside the hive, I smelled the lemony scent of bees communicating about a queen. Within 20 minutes, they had entered the hive, and the spectacle was over. 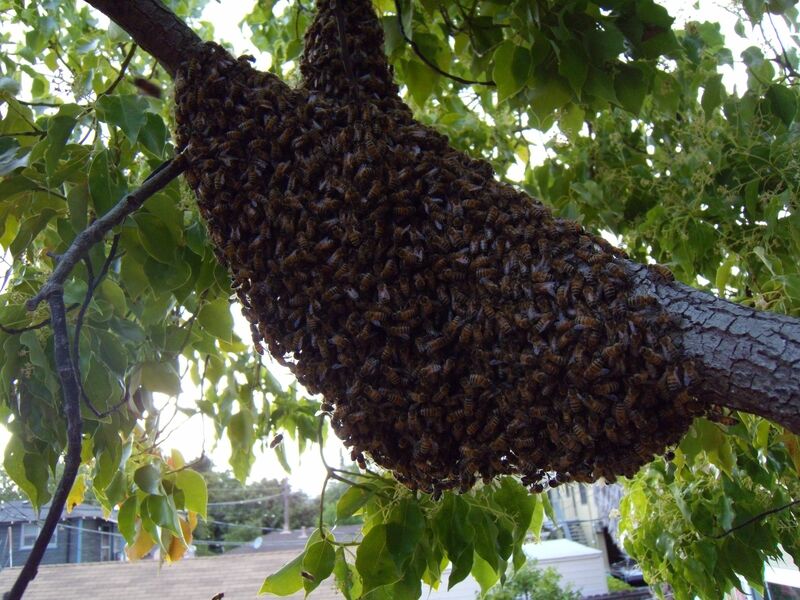 Debi astutely suggested that the bees remaining on the tree branch must have realized they had lost their queen and returned to the hive from which their swarm had issued. 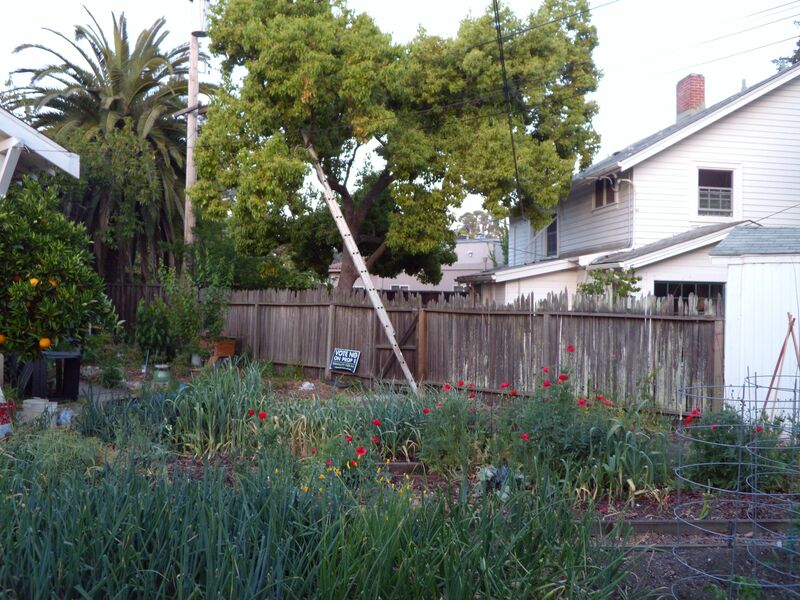 As of dusk, the bee yard is quiet. A few bees are coming and going from the new top-bar and, peeking in the observation window, I can see a mass of bees hanging along the back of the hive. They are in one clump and haven’t separated into the multiple clumps we associate with Mondo’s multi-queen swarms. If this secondary swarm really has only one queen, it marks the first time that we have seen Mondo’s lineage limit itself to swarming with just one queen. 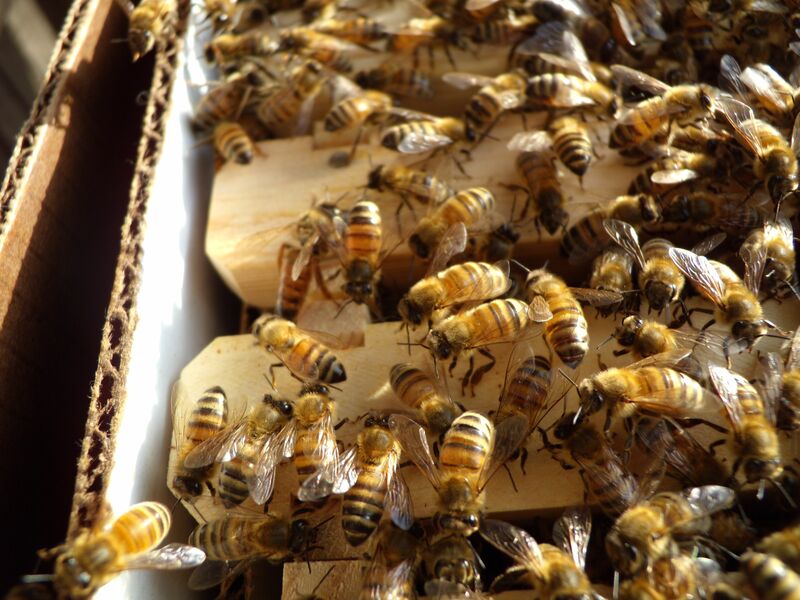 We were starting to think that multi-queen swarms must be a dominant genetic trait. What fun, and how useful, to have an observation window through which to spy on the bees. Mondo herself appears quiet, as does the primary swarm we hived last week. 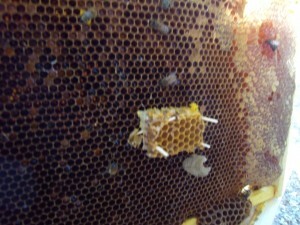 As a side note, I inspected that new hive yesterday and found several frames of uncapped brood and eggs already laid. This confirms our suspicion that the swarm is a primary one, issuing with the mated queen that overwintered in the hive. We are excited to follow her journey and see if she survives another winter. 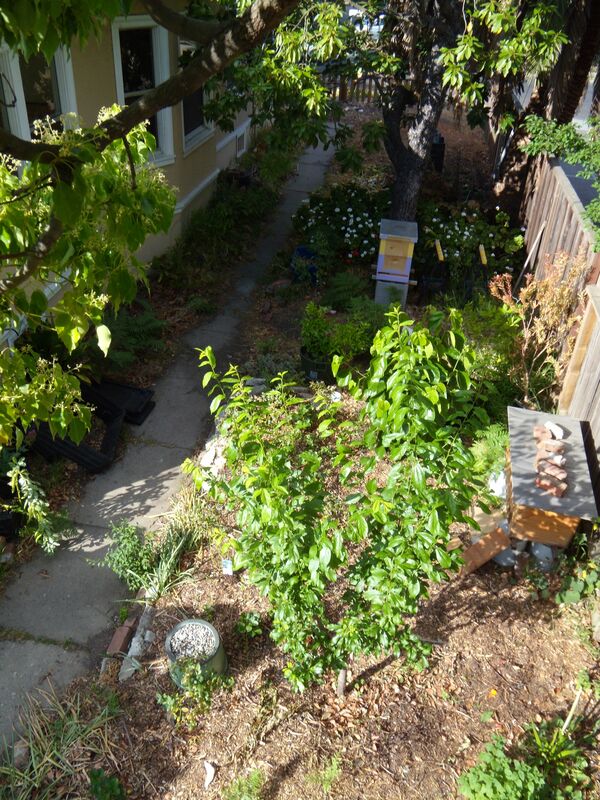 As for our newly populated top-bar hive, we’ve named the colony T.R., after the neighbor who kindly phoned to inform us that our bees were “swarming everywhere in the backyard!” Here’s hoping they stay put.